This post is about IF sentences or Conditionals. This is also Week 10 of the syllabus that was chosen by the learners. In this post I will share a lesson that I did which focuses on consciousness-raising – making the learners aware of conditional forms as they are used in real life. For busy teachers the lesson plan with all handouts is available from Google docs here. I recently completed the Training the Trainer course at Oxford Tefl Prague. While observing one of the teachers there, the issue of ‘pedagogical truth’ came up: how there is a gap between what we teach and how the language is actually spoken. But it doesn’t have to be like this. I believe that one of the enabling conditions for Decentralised Teaching is that the distance between academic knowledge and practitioners is narrowing. Teachers are increasingly able to use concepts, ideas and theories directly from SLA research in their teaching and can feedback these results through action research or more informally through blogs. We can see increasing interaction between the two in projects such as the ELT Research Blog carnival. Moreover, with the rise of corpus-based research we should be able to give learners more accurate information on how English is really spoken. The conservatism of the ELT publishing industry, and the time it takes to incorporate new developments in ELT into existing coursebooks may mean that learners are missing out on opportunities to pick up more sophisticated, authentic and useful grammar structures and vocabulary, though I accept that corpus research has started to influence new ELT materials. The fact is that language (even by competent non-natives) is just much more varied in real life than how it is presented in coursebooks. If you haven’t been to Venice – you haven’t lived! What’s so interesting about conditionals? Conditionals are sometimes difficult for learners, as different languages have different ways of expressing contingency. But even when learners grasp the forms and meaning of conditional sentences they lack the ability to create more sophisticated conditional structures with confidence. This has a lot to do with the way that conditionals are presented, as zero, 1, 2 and 3 which are often perceived as ‘fixed’ categories. Maule (1988) wrote that a more accurate division of conditionals than the ‘standard’ zero, 1, 2 and 3 is to divide them into Real past/ non-past and Unreal past/ non-past. Below is a table showing examples (taken from Jones and Waller 2010, adapted from Maule 1988:122). Maule’s sample was taken from a random selection of television programmes, while Jones and Waller used a random sample of 250 concordance lines from the British National Corpus (2009). Jones and Waller found that in 192 examples taken from the Corpus (of 250, some were omitted for not using If, or being fragmented ), 131 fit into Maule’s category A. This means that approximately two thirds of conditional use in the study was Real Non-past. Also, they found that this category comprised of 24 different patterns! It’s also worth noting that the third conditional came up only 6 times. What are the pedagogical implications of this? Anyone seen a third conditional recently? As Michael Lewis says (referred to by Maule), by artificially simplifying language we are only storing up trouble for later. For example, why are we teaching the first conditional when, in its classic form, it’s actually quite rare. 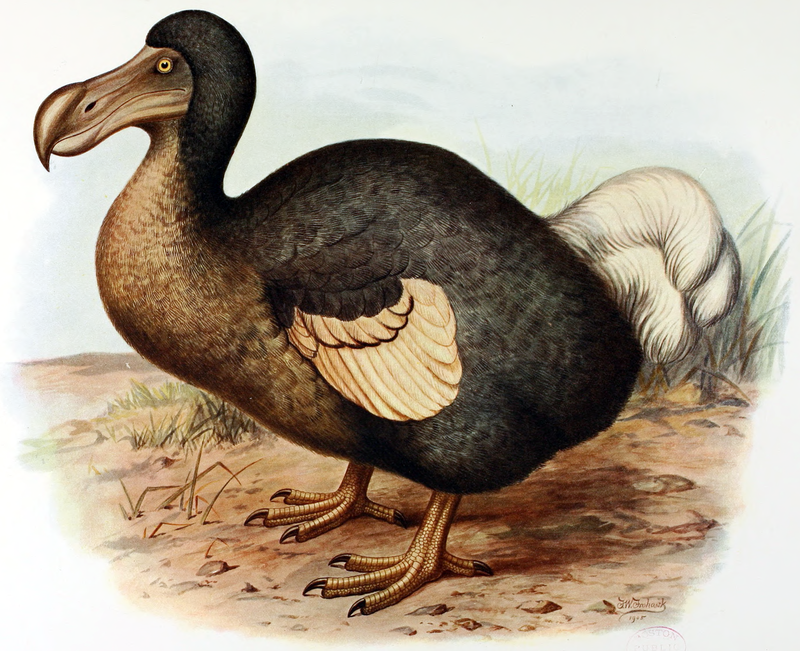 Likewise, the Third Conditional is the grammatical equivalent of a dodo! This would seem to chime with my own and other teacher’s experience when teaching conditionals, which amounts to – would anyone actually say that? E.g. If the sun shines I will be happy. It’s also true that learners have no idea of the comparative frequency and usefulness of the different conditionals. Dividing them into ‘neat’ compartments, while providing a good rule of thumb, risks blinding them to the more messy but genuine uses of conditionals in real life and may restrict their learners ability to communicate effectively in certain situations. Making learners more aware of the different variations of conditionals can, I think, help them to speak with more variety and confidence. What are the risks here? Of course, if learners are already struggling to learn the ‘standard’ conditional forms any more complexity runs the risk of overloading the students. But maybe the ‘standard’ forms are not fit for purpose anymore? The lesson is designed to be an inductive, ‘consciousness-raising’ materials-light lesson to promote a wider awareness of conditional use and is designed to be used at B2+ level. Moreover, the lesson has a real-life situation as its core; so many lessons on conditionals are divorced from real-life decisions and situations. Which doesn’t make sense when teaching a form that deals with contingency! Finally, the lesson is designed to be engaging and fun for the learners. There are 7 stages in the lesson and it’s divided into two parts, Pre-Text (the text here is a film) and Post-Text. Of course, you’re free to modify anything as you see fit – the full lesson with handouts is available here. 1) The teacher goes over conventional zero, 1, 2 and 3rd conditional forms with learners using the WB. 2) Teacher gives five sentences to learners and asks them to compare them with these traditional conditional forms. This is to start them thinking beyond zero, 1, 2 and 3 conditionals. Some of these sentences are adapted from Jones & Waller (2010), where you will find plenty of examples of non-traditional conditionals. 1. If we’re going to eat out tonight, then let’s go to that new Italian! 2. If they’re closed, I can wait til tomorrow. 3. If you wanted to know the answer, you had to keep pressing the ‘show’ button. 4. If anything could send strange signals, the Thing could. 5. If I had known that I would have done it. b) Real past e.g. If you watched the film, you saw how many of my friends got married and had children. c) Unreal non-past e.g. I would tell her to get married if she was my daughter. d) Unreal past e.g. If her parents hadn’t divorced, perhaps she would have got married sooner. There was a very good response to this lesson. The learners found it difficult to grasp the distinction between the four categories (as I did at first!) but it became easier as the lesson progressed. The video was engaging and they were coming up with a lot of interesting sentences which varied from the normal forms given in coursebooks. Hope that you found this lesson useful – there is a Google doc with all the handouts in teacher-friendly formats here – drop me a line if you use this material in class! Jones, C. & Waller, D. (2010). ‘If only it were true: the problem with the four conditionals’. ELT Journal. OUP. Maule, D. (1988). “’Sorry, but if he comes, I go’: teaching conditionals”. ELT Journal Volume 42/2, April 1988. OUP. This is not spam. Just testing what happens when I post a comment on here. Phil. Your ideas are a lot more developed so thanks again and I’ll be giving this a try! Many thanks for your kind comments! I’m so glad that someone else feels the same way as I do about teaching conditionals. I had a student at B2/C1 the other day and I spent the whole lesson ‘unteaching’ the 0,1,2 and 3 fixed categories and explaining that there’s a lot more variety out there in the real world (‘jungle english’). I have no problem in theory with teaching rules of thumb, but when the gap between what is taught and what is spoken becomes a chasm, then I think we should change the way we teach. BTW, your lesson is really interesting and I’ll try it in class- thanks for sharing. I think at the very least your learners will have a broader, more holistic view of conditionals than I did when I finished my CELTA! This entry was posted on January 20, 2014 by paulwalsh in DCT in action, For Teachers, Lessons and tagged blog, conditionals, consciousness-raising, corpus, coursebooks, Decentralised Teaching, Decentralized Teaching, dodo, ELT, Grammar, If, marriage, negotiated syllabus, pedagogy, power, real, unreal.